... but I got cooked too.... my upper arm still hurts! 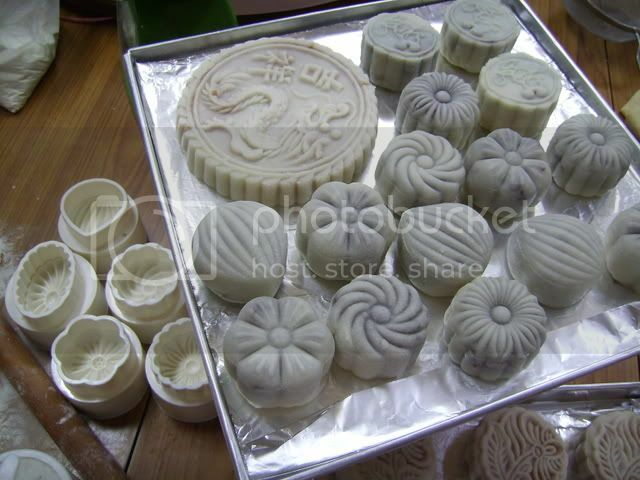 Back to mooncakes, these are some non-bake/crystal pastry mooncakes I made some years back. I used red bean paste filling for these to make sure there is a good contrast. that's what happens when you believe just the apron is sufficient coverage while cooking. Thanks! Got to try to live up to my handle! 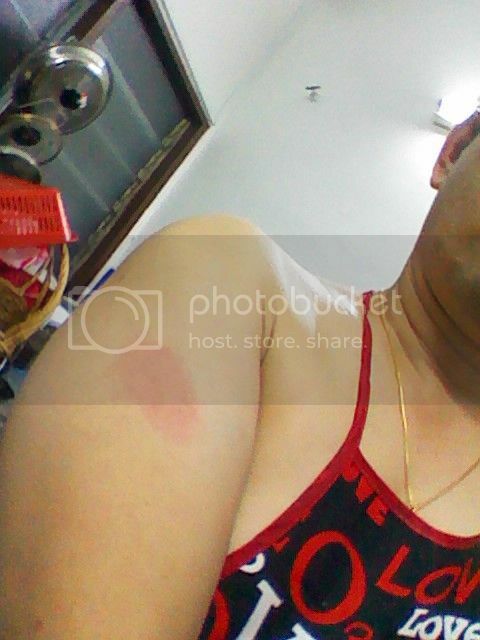 It is hot and hard work, so I thought wearing less would feel more cooling... and then my arm gets splattered. Ouch! so I spent the Sunday baking. 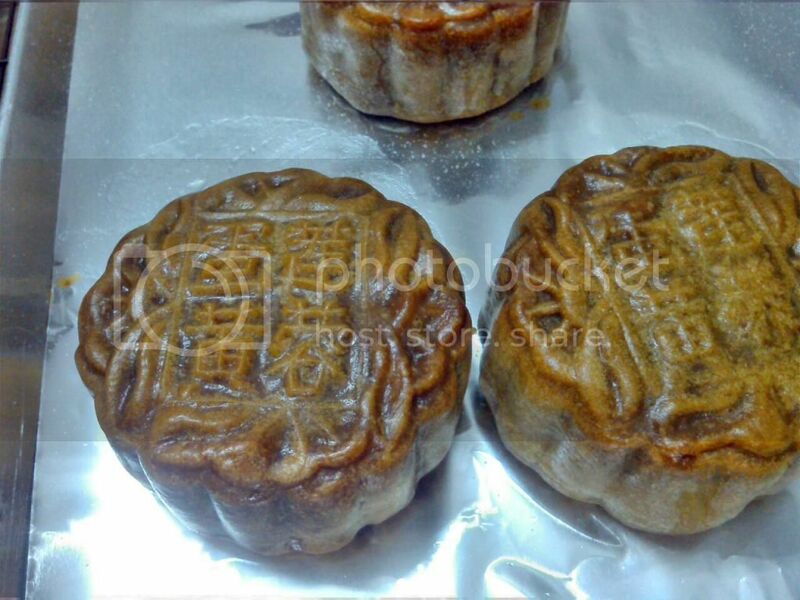 A closeup of one of the mooncakes. This one is Lotus Paste with Single Egg Yolk. 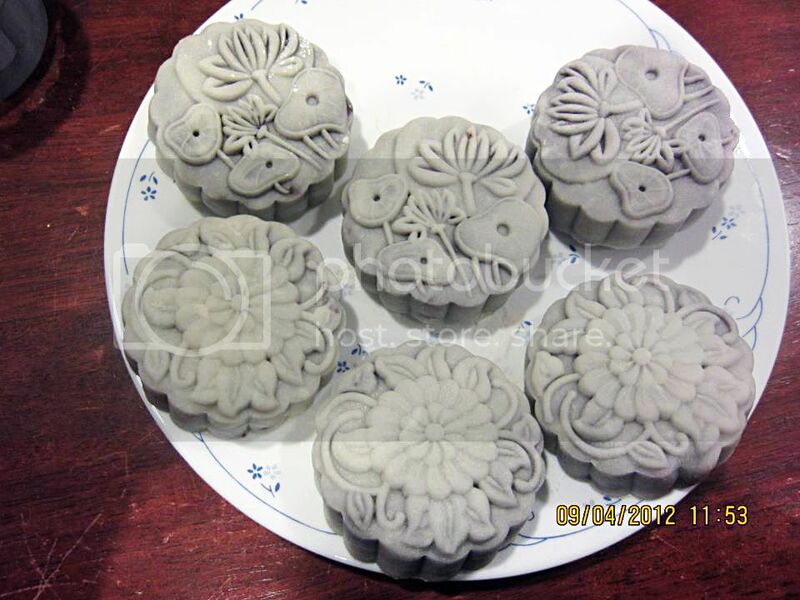 I made these mooncake figurines last year. 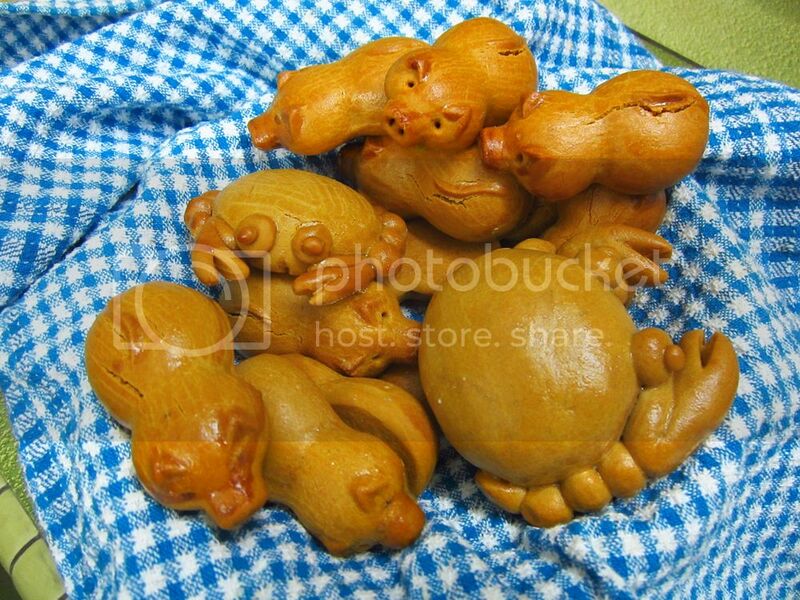 The piglets are made using a mould. The crabs are hand crafted. I rather liked the crabs. 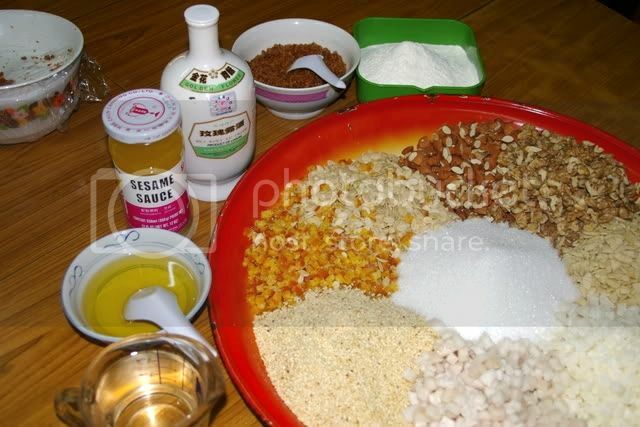 These are the ingredients for the Five Kernel Chinese Ham mooncakes, 伍仁金腿 . The Five Kernel mooncakes required five types of kernels. Last year, one type was both expensive and not quite fresh, so I did not use that kernel. I could not think of a viable alternative kernel, so I omitted it altogether, making my mooncake a Four Kernel Mooncake - 四仁月饼. Alas, I sounded too much like a curse - 死人月饼 so I lied and told everyone that it was a Five Kernel Mooncake. 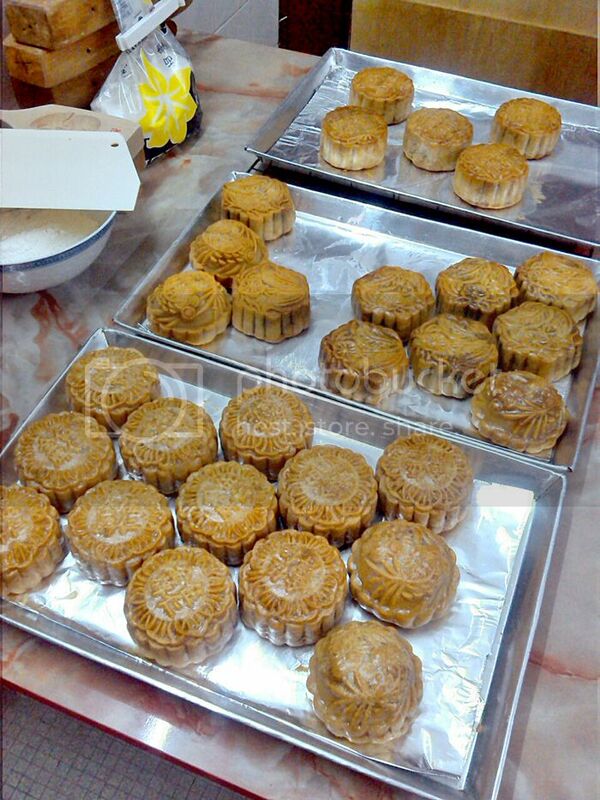 I was lucky that I tasted Chef Ying's mooncakes. It was really good. Chef is really a talented chef. Anyway...I like the name...West Chamber Confectionery. PS: I haven't eaten my mooncake. I got egg yolk and lotus paste Cantonese style is the best! Will make and bring you mooncakes the next time we meet. I only eat lotus paste and egg yolk mooncake this year. 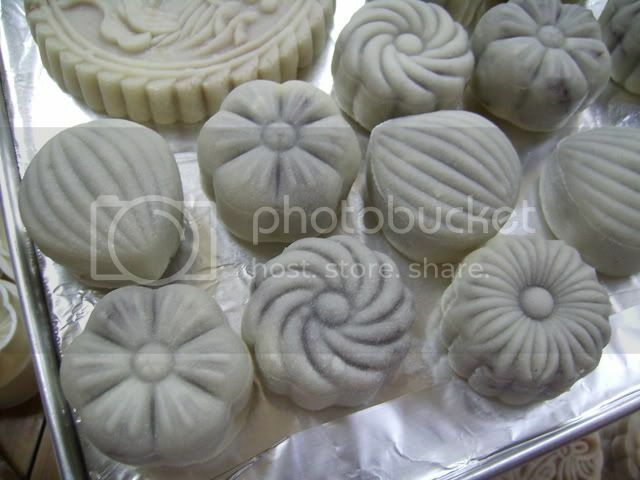 Never find a real good red bean paste mooncake. 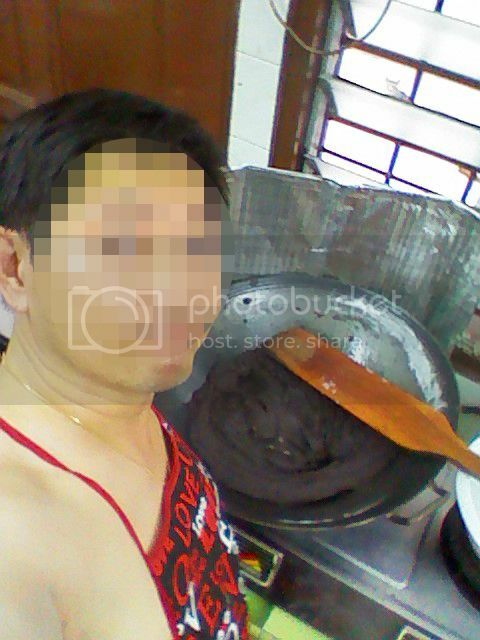 How is it looks like Chef? In my country (indonesia), we don't have red bean paste too. But there's a variant that is quite special from Indonesia, which is durian paste + egg yolk. Some of you might jump from your seat. But trust me...it's really good I'm not a big fan of durian. But a combination of durian and egg yolk is awesome. chefying : if you like durian, you should try to make it. it's really awesome! 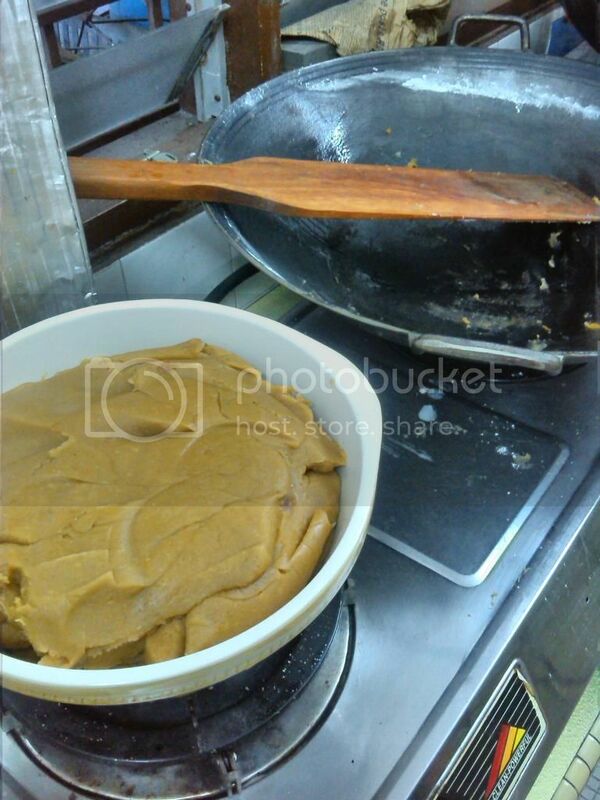 Red bean paste is dark - after all, it is made from red beans - and the texture is more coarse than the lotus paste. 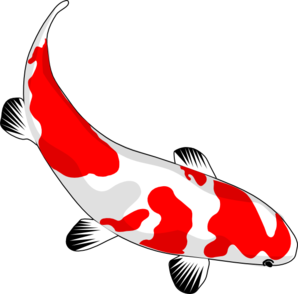 As an added flavour, some people use rose sugar to cook it. Rose sugar is sugar mixed with rose petals to give it a rose flavour. Hmm, durians may not be in season during mooncake festival. I have bought chempedak mooncakes from Indonesia before. It taste... different. anyway...I like the name of your West Chamber Confectionery. But I just realized...that the acronym would be WC Confectionery Still it is a good name though!